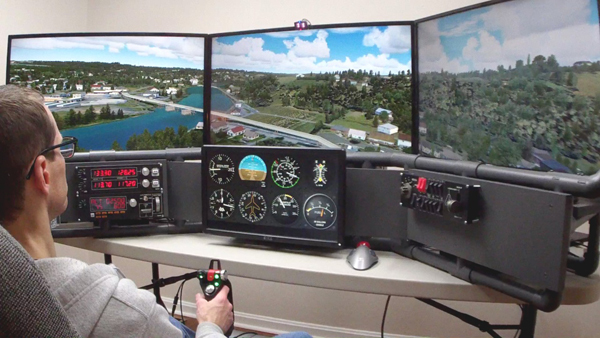 I can show you how to build your own home flight simulator. You can build an impressive home cockpit with materials from a home improvement store, flight controls from Amazon, and standard computer equipment. Best of all, my website has more than just DIY flight simulator cockpit plans, each project includes detailed videos and instruction manuals. The slides below show you step by step how to order a DIY Flight Sims digital project. Every project is an instant digital download and as a result you don’t have to wait for shipping. I do not sell the building materials, therefore you just buy them from your local hardware store. The instruction manuals and labels are in Adobe pdf format. You can download the free Adobe reader here. The videos are in Windows Media Video (wmv) format. Your computer should be able to play them. If you are using an Apple Mac or other Apple product, you will probably need a couple of free apps to view the files. You can download the Adobe reader for Mac here and you can download the free Windows Media Video viewer here. Alternatively, you can print out a paper order form and mail in your order. Get the order form here.